We have some readers who are very firm believers in not visiting chains of any kind. There is a misconception that has spread, because of some of the fast food chains. In our opinion, not all chains are bad. Sometimes you discover food that is so good, you wish to enjoy it when they are back in your hometown. Of course, not all places can spread to every city, so we still need to travel to find them. 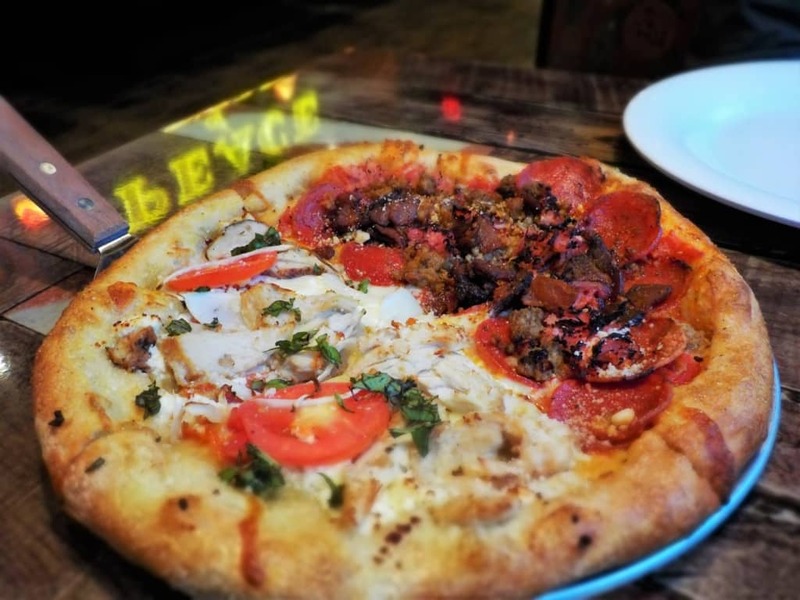 This is the case for Mellow Mushroom. 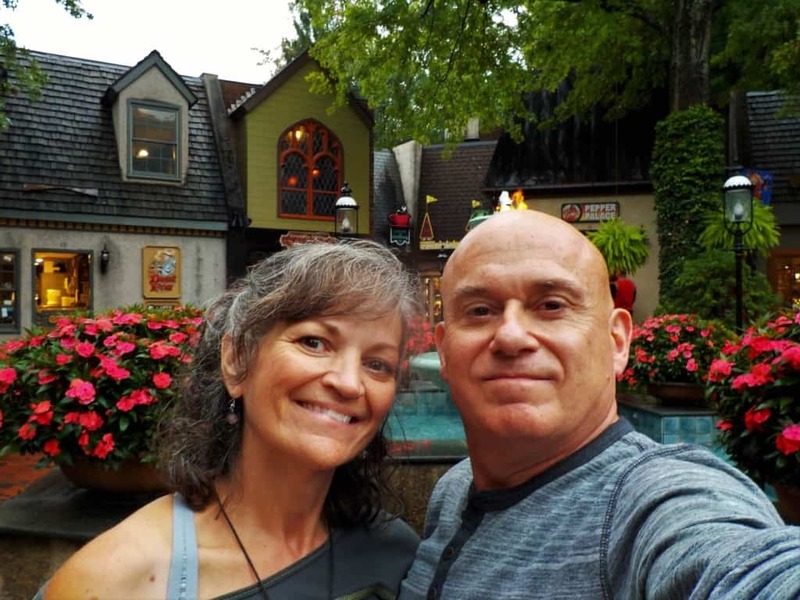 We had the pleasure of trying their peace of pizza in downtown Gatlinburg, Tennessee. We look at chains as being businesses that are succeeding. One of the most difficult things to achieve in the restaurant business is consistency. While it can be fun and exciting to create a new dish, being able to recreate that experience over and over is a bit more of a reach. For a business to grow into a successful chain, it must be able to replicate the same experience for customers in each of its locations. Some, such as fast food stops, do this by minimizing the extent of flavors they offer. We don’t really find a reason to highlight these to our readers. There are others though, that don’t shy away from letting their originality shine through. These are the places, that we believe, need to be considered as additions to your itinerary when traveling to new destinations. As we explored the “Strip” in downtown Gatlinburg, we ran across a myriad of dining options. You can find just about every cuisine imaginable, but on this day we had a hankering for a pizza pie. The light rain was enough to keep the larger crowds down, which made our wandering more enjoyable. We spotted the Mellow Mushroom signage nearby one of the moonshine shops that dot the landscape. Moonshine Tastings are a sure sign that you are in the Appalachian region. Once inside, we took the colorful steps up to their second story perch. 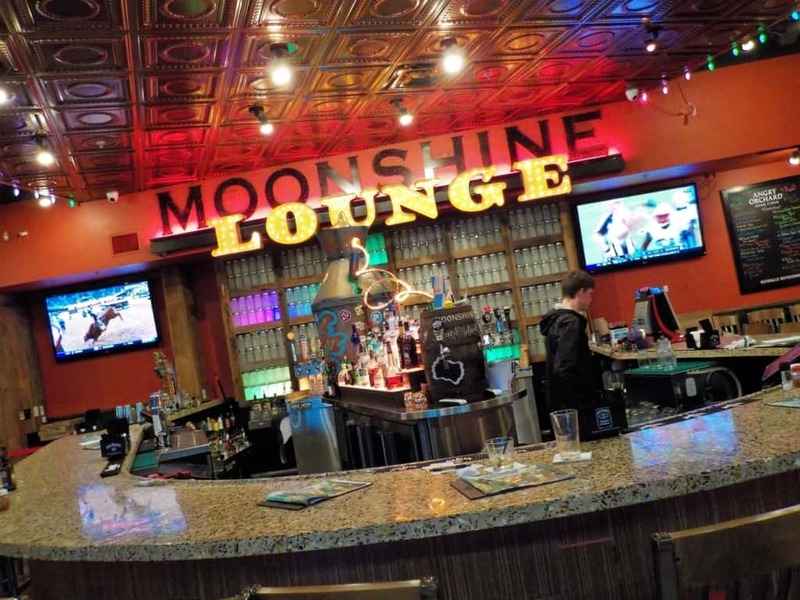 One of the first things to greet our sight was the Moonshine Lounge, which serves up adult concoctions to compliment your meal. 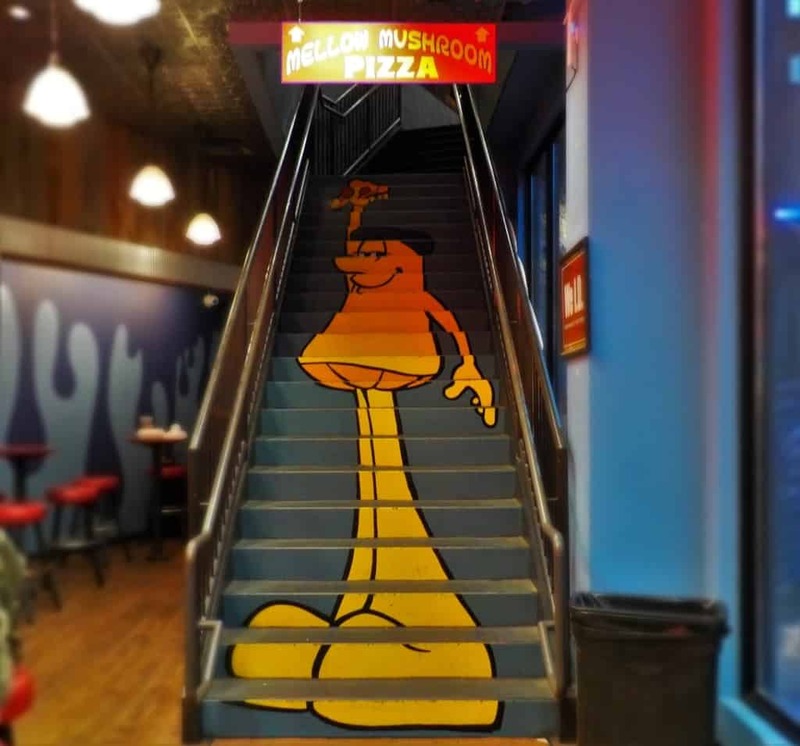 Mellow Mushroom began their journey in 1974, so they have tons of pizza making experience. Over the years, they have expressed themselves through the artwork that fills each of their locations. While “Peace of Pizza” is a play on words, they have incorporated this theme into their daily lives. In the early days, they would have friends offering to paint the colorful murals to hang in their restaurant. This idea has continued, and each of their stores has its own unique “flavor”. 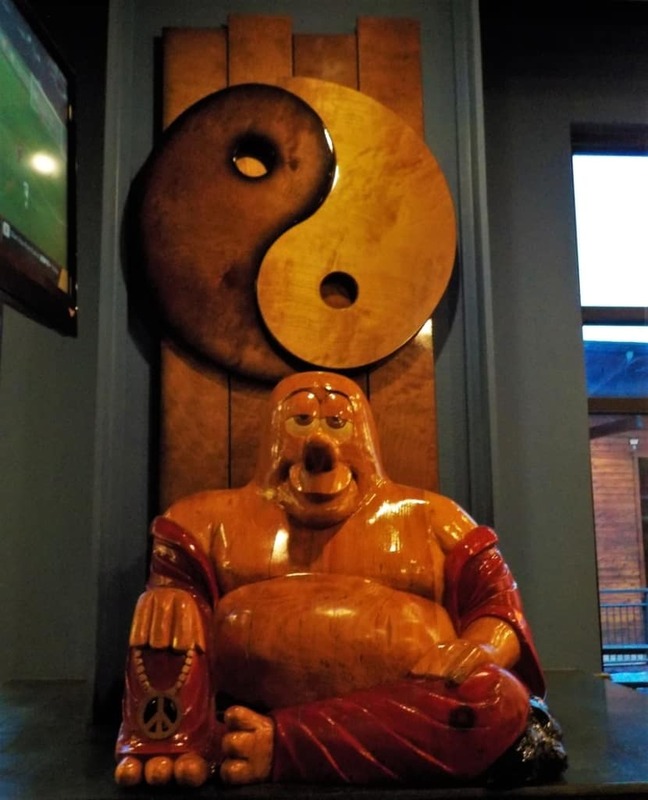 It reminded us of the unique artwork we found at Artego Pizza in our hometown. (You can see more about Artego here.) With all of this eye candy surrounding us, we settled into a comfy booth near the windows. Outside the rain fell along the strip, but we were comfortably positioned to watch the passing storm. Our server walked us through the Mellow Mushroom menu, which includes a variety of dishes common in pizzerias. While a hoagie or calzone sounded appealing, our visit was destined to include a peace of pizza. Being ones to have our heaviest meal at breakfast, we decided a small pie would suffice. At most pizza shops we would have to compromise on which variety to select, when ordering a small pie. Mellow Mushroom surprised us by allowing the combination of two styles on our small pizza. I immediately gravitated to the Mighty Meat, which includes pepperoni, sausage, beef, ham, and smoked bacon. Crystal decided to order the Great White and had them toss on some grilled chicken. We have to admit that we were quite excited that we found a place that allowed this customization. 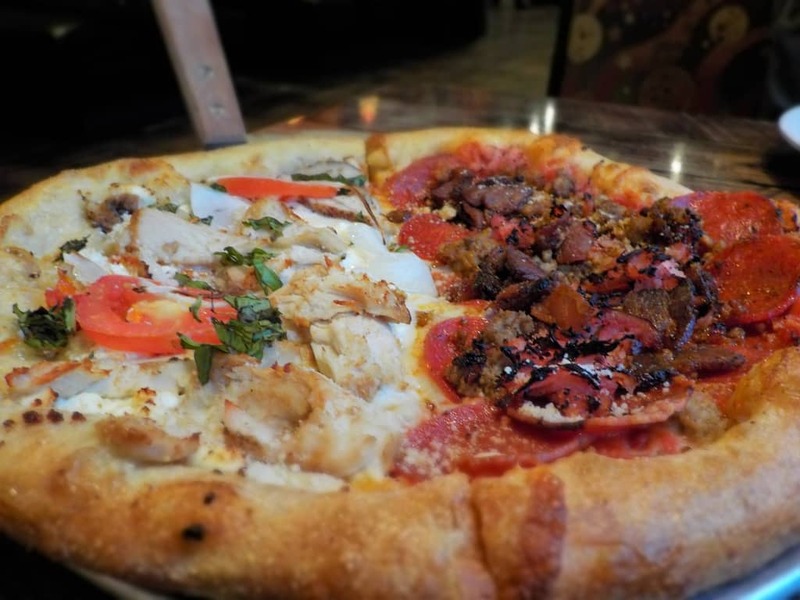 While we have only sampled the one Mellow Mushroom location, we were quite satisfied with the results. A bite from Crystal’s choice offered a smooth flavor that was kicked up with the tang of the feta cheese. My style was a protein filled meal, that I knew would sustain me through an afternoon of exploring. Our server was extremely attentive without hovering and seemed happy that we enjoyed our pie. The small size was just enough to satisfy our hungers, without the need for leftovers. (That is something we avoid when traveling.) We noticed that the rain showers had passed on by, so it signaled the time for us to head back out onto the strip. Having identified a new restaurant that we could sample in other locations, we were satisfied with our peace of pizza experience. 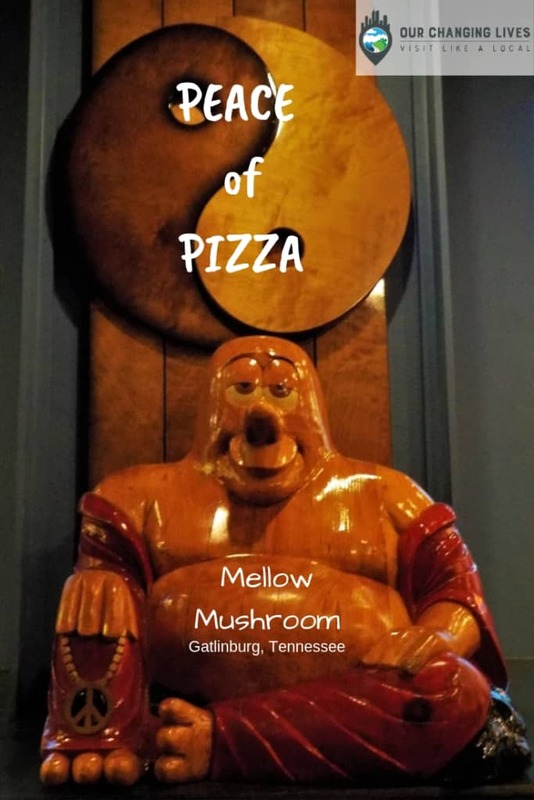 Have you ever sampled the pies at Mellow Mushroom? We’d love to hear about some of their other locations. Share with a Pizza Lover!